Are you considering a xeriscape? Come look at the native plants available at the nursery. Looking for shade? 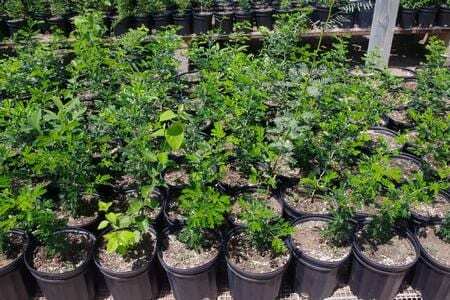 We have trees such as the Texas ebano and cedar elms. How about creating a hedge with cenizo or manzanita? Want to attract birds? Try a granjeno, an anacua, or some chilipiquin. For butterflies, buy a colima, one of the host plants for the giant swallowtail, or the Texas lantana, a food source for many of the butterflies in the area. Hummingbirds love scarlet sage and bouganvillas. Plants are available both retail and wholesale. (Please bring your sales tax exemption form.) 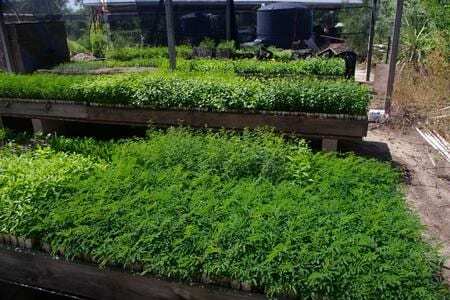 We also provide custom growing for revegetation projects. Call for inventory and for prices on custom growing. Often, our custom orders are grown in biodegradable plant bands which can be transplanted directly into the ground. 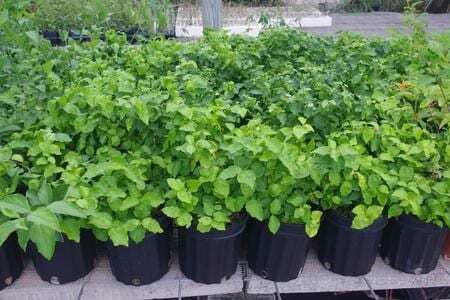 One gallon Texas ebanos ready for your landscape. For those of you who want to learn more about the many uses of the native plants of our area, make arrangements to join us for a guided tour. 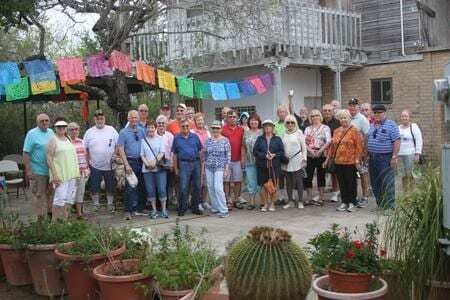 Tours are generally conducted from October through May. Learn of one plant you can use to build a shelter, wash your clothes, and then make a little something to eat. You can also learn how to rid yourself of Montezuma's revenge with another plant, and why you should never make a necklace with the seeds of another of our popular native plants. 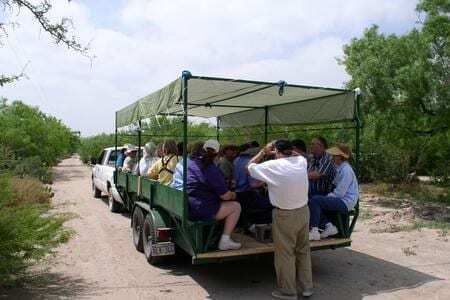 There are two ways to enjoy a tour at Rancho Lomitas, regularly scheduled public tours or specially scheduled tours. All tours last two hours. Regularly scheduled tours will be scheduled at least once per month from October through May. Call (956) 486-2576 or email us at info@rancholomitas.com to learn of upcoming dates. Tour dates will also be announced on our Facebook page at least one week prior to the tour date. To attend a regularly scheduled tour, contact us to reserve your spot as there is a limit of 30 individuals per tour. Guests must provide a contact name, phone number, and email if possible. Reservations may be made as late as noon the day prior to the tour. Tours may cancel due to inclement weather as all tours take place outdoors. We will use your contact information on your reservation to contact you regarding cancellations, so please check your voice mail and email prior to departing for the ranch. The tours begin sharply at 10:00 a.m. and end at noon. The gates to the ranch open at 9:30 a.m. and will be locked shortly after 10:00 a.m. as latecomers will not be allowed to join the tour. Refreshments will be served on the patio of the main house prior to the beginning of the tour. Restrooms are available in a building near the main house. The cost for adults is $15.00 per person and children pay half price. March’s public native plant tour is scheduled for March 23, 2019. Please plan to arrive no later than 9:45 to join us for coffee and pan dulce on the patio. Call, email, or follow us on Facebook to learn the date of April 2019's public tour. Tours are generally limited to 30 people. We can accommodate larger groups, but special arrangements must be made. Special tours are available for school groups of at least 20 at $7.50 per student. If it is a morning tour, have the children bring a sack lunch to enjoy on the patio. Specially scheduled tours begin at 10:00 a.m. and end at noon unless other arrangements are made beforehand. Gates open at 9:30 a.m. Plan to arrive a few minutes early to enjoy refreshments on the patio. If you join us on a weekend, you may get to sample a dish prepared with a native plant.